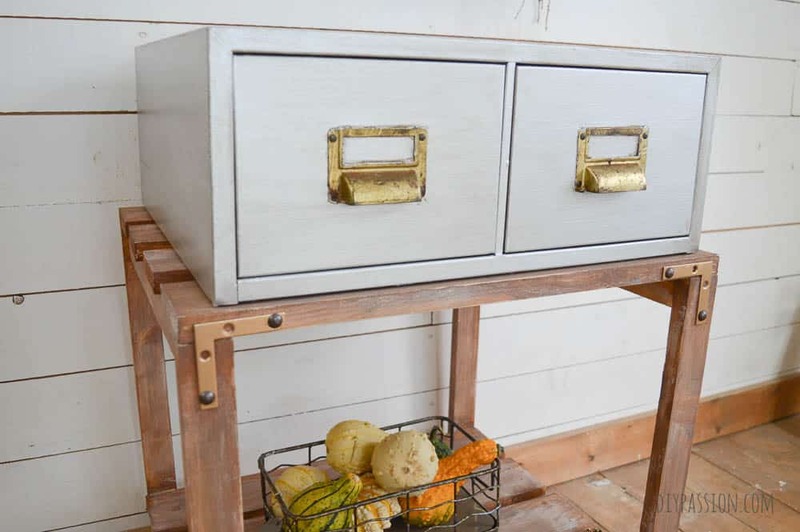 Inside: The best paint technique for painting metal to look galvanized; how to prime and finish an old card catalog to turn it into a piece of vintage looking furniture. I love redoing furniture and finding new life in lifeless things; but sometimes it’s a terrifying endeavour. Sometimes, the vision feels so far beyond what is realistic, that it doesn’t seem possible, as was the case with this metal card catalog. 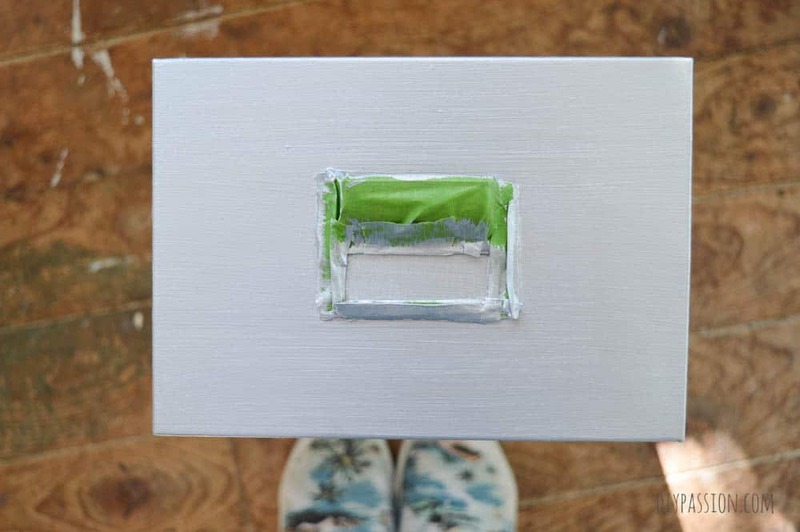 I took a chance and here’s how I primed and painted the galvanized metal. 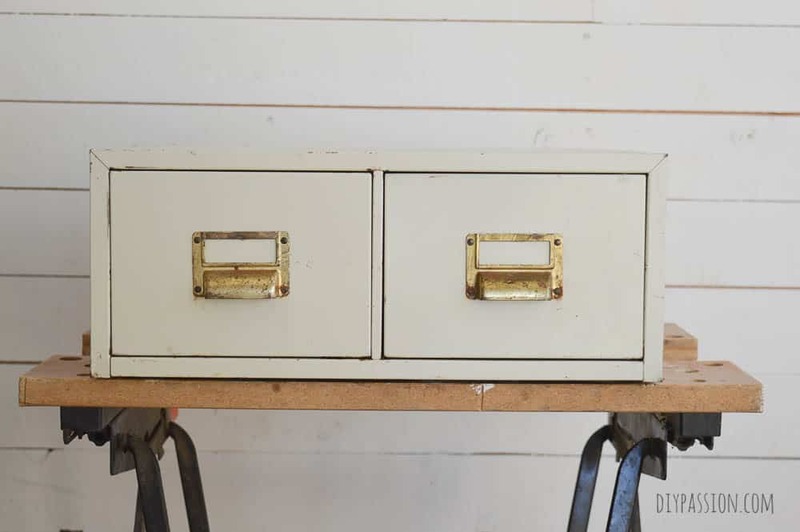 I’ve done a few other painted metal projects, including painting vintage metal lockers. I used a different technique for those and opted to paint them with chalk style paint. 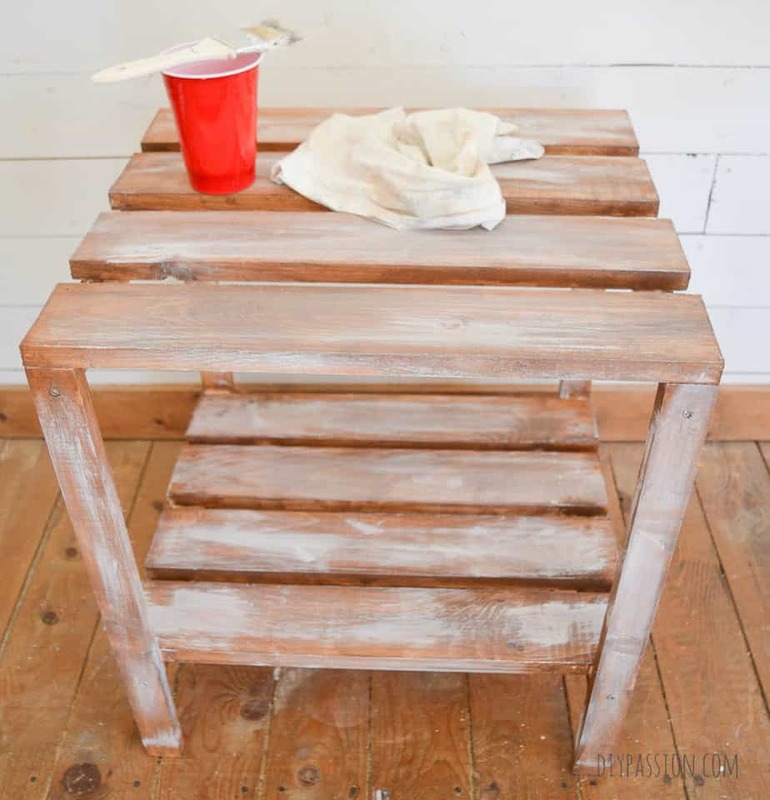 Also check out my faux concrete painted outdoor planters and my DIY bed risers too! First things first; I had to build a base for it to sit on. 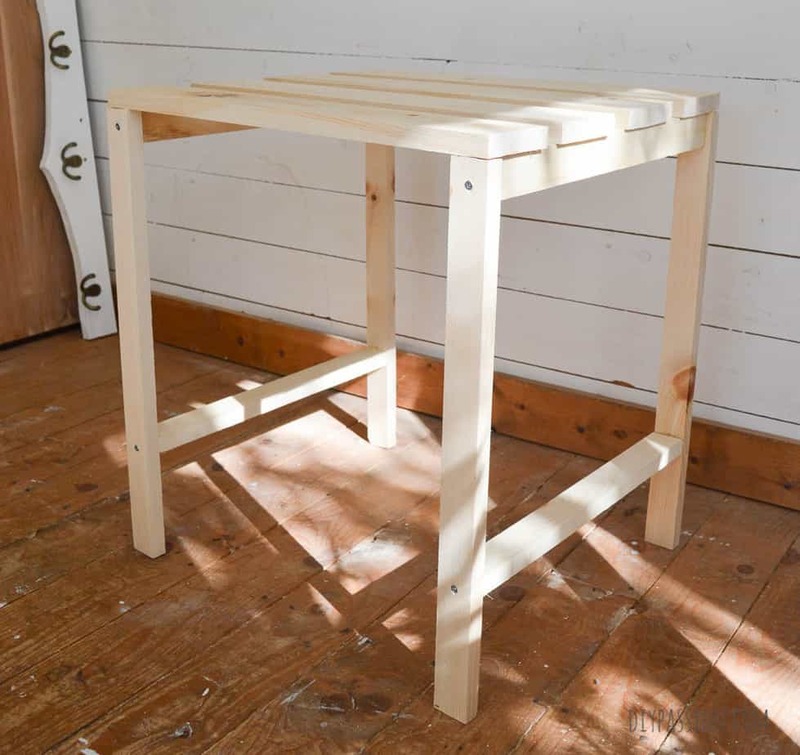 Having it up off the floor makes it infinitely easier to use (and means one day it could be an end table in another room of the house!) 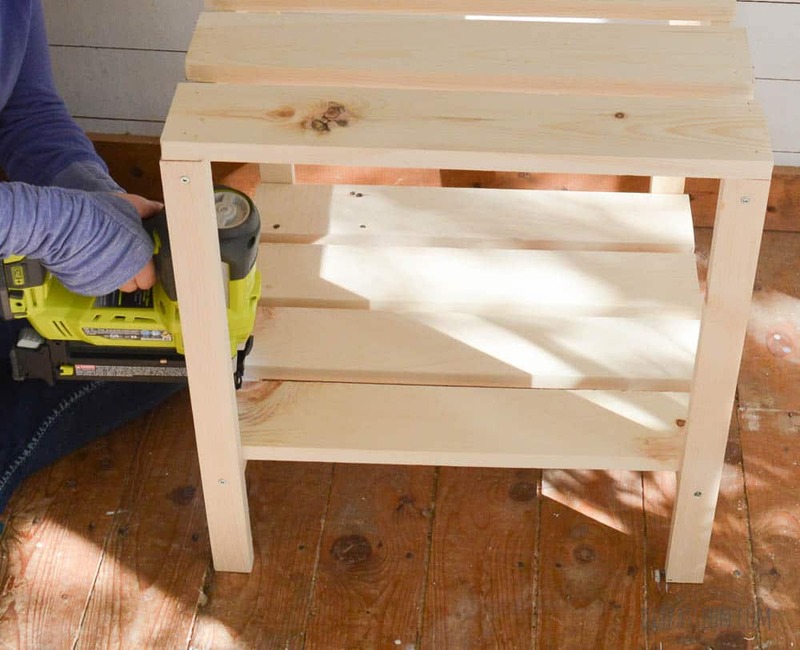 I decided that what would make it even EASIER was to build it a little table for it it sit on. 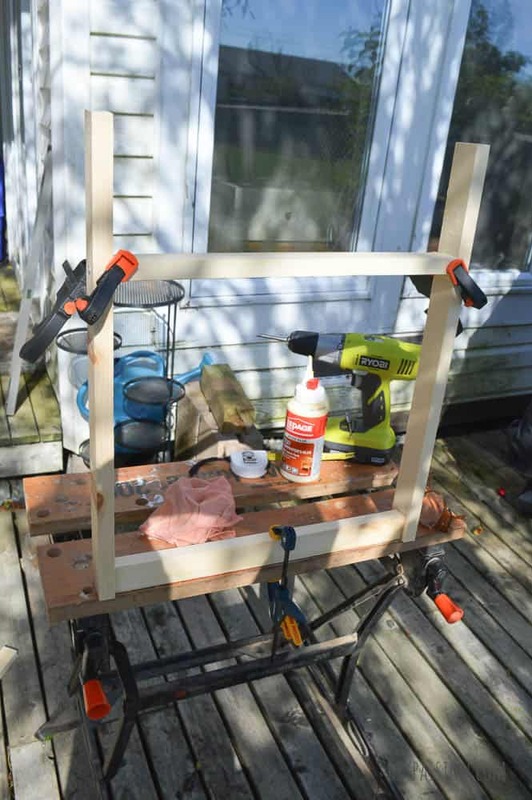 Using wood glue, my drill (I have this one) and wood screws, I created two basic H-frames. 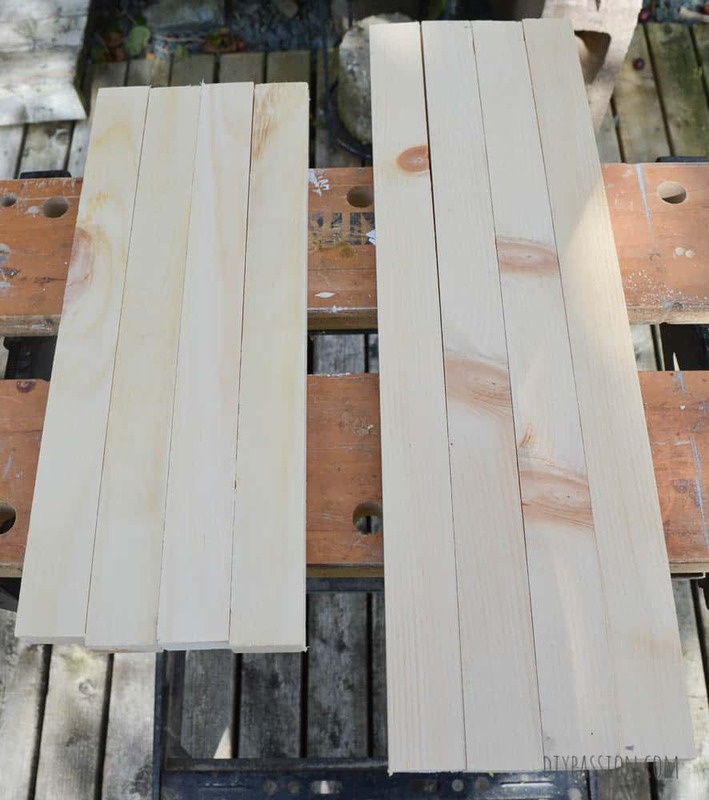 Then I cut some 1x4s; eight of them into 20″ lengths. I just used my circular saw. I confirmed that the card catalog fit and wasn’t wobbly on the table base and set to work. I started with a good cleaning of the card catalogue and then a solid coat of stain blocking and gripping primer. I’ve never really primed or painted metal before and I was quite surprised at how quickly it dried to the touch. I used a 2″ foam brush to apply an even coat. The next step is the most exciting. 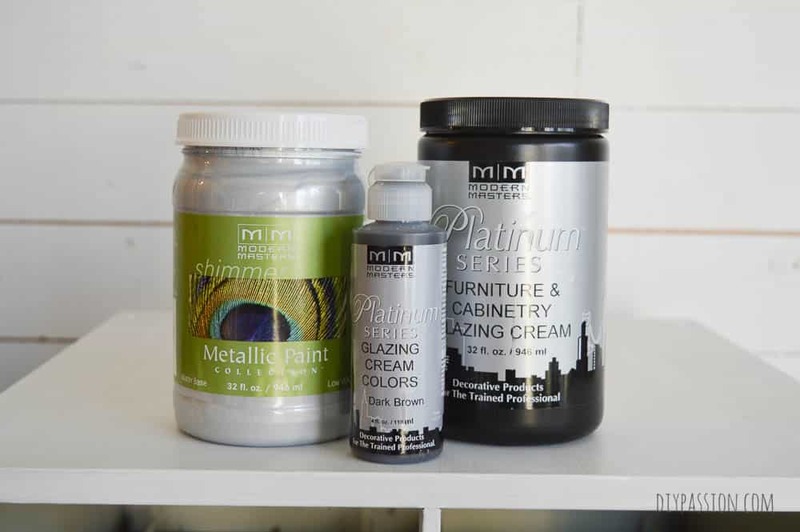 I used Modern Masters Platinum paint in silver. I taped off the hardware, because I actually couldn’t figure out how to get it off. Let’s talk about this paint for a minute. It’s incredible. It has ACTUAL metal in it, so it bonds incredibly well. I used a soft bristle brush to apply it to my card catalogue. The silver tint is a semi-opaque and it says right on the bottle that it will require three coats to get good coverage. 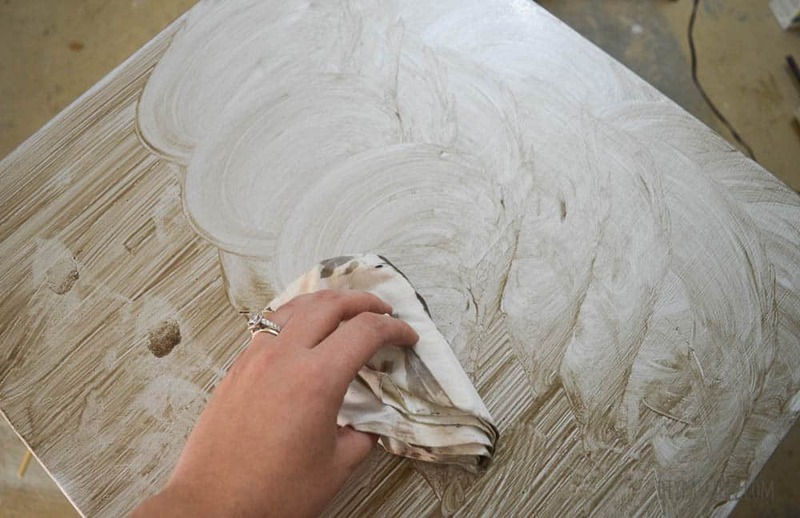 Three coats were perfect to get rid of that drab beige. Here’s the process I used. 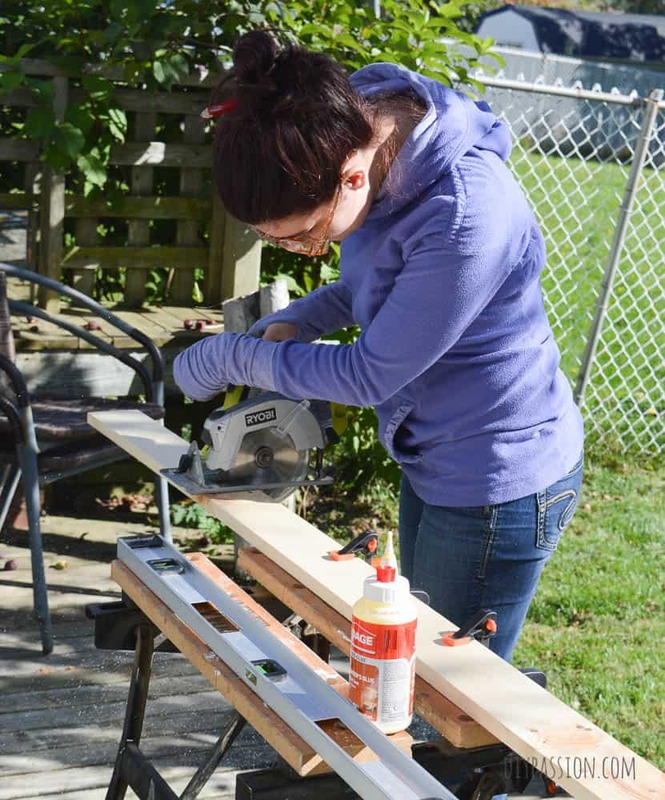 I followed the basic guidelines in this tutorial post by Redoux Interiors – but she was working on a wooden table top. I wanted this too look like grunge-y metal. Step One was to cover the card catalogue with one coat of glaze. I used a 1-inch craft brush because it gave me good control and I just slapped it on. 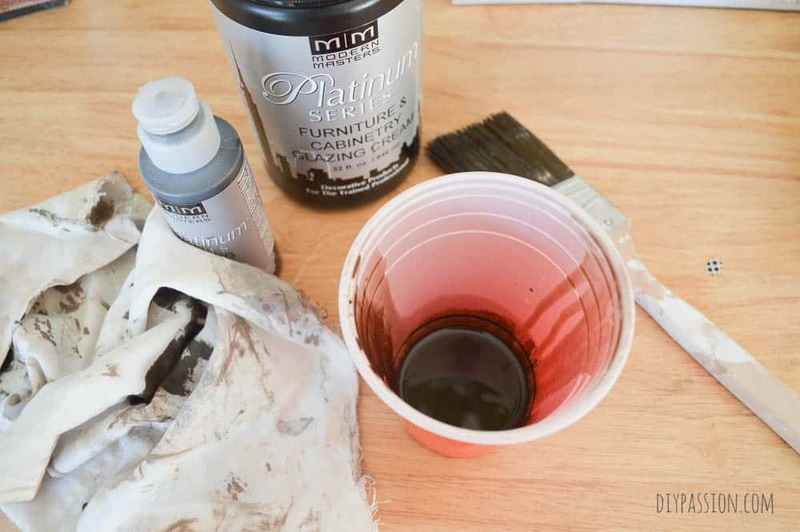 Step Two was to add a hefty drop of the actual Dark Brown tint to my rag and ‘pounce’ it onto the cabinet. Do this in a random pattern. Step Three is to rub that in. Use a good deal of pressure and work in circles. Normally, you wouldn’t do circles – but I found this distributed the darker colour in a ‘perfectly uneven’ way. Step Four is to go back and get rid of those circles! 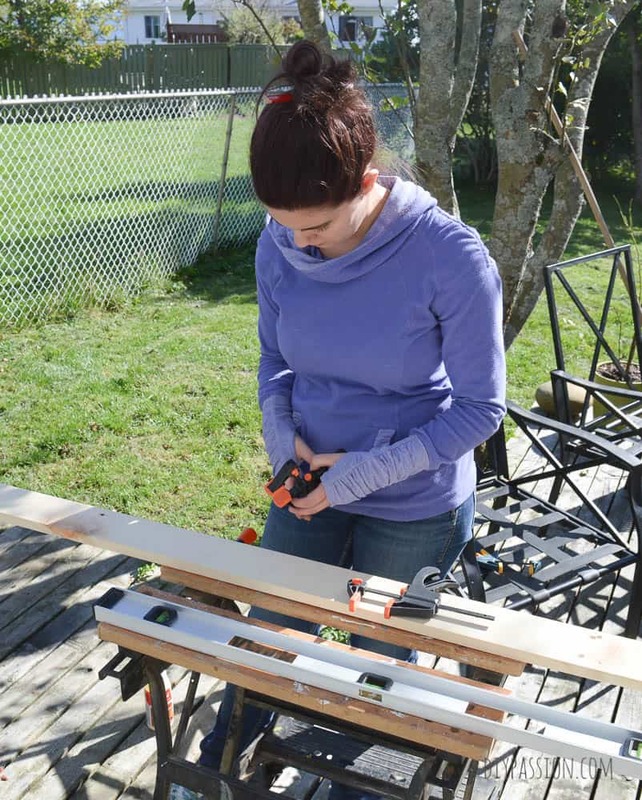 I dragged a 2.5″ angle brush across the cabinet and then followed that with a light hand and my rag to eliminate any curvy lines. The other beautiful thing about this glaze is that it’s slow drying, which gives you plenty of time to work with it once it’s on your piece. It also means it’s easy to layer and create wonderful depth. I’m really enamoured with this product. 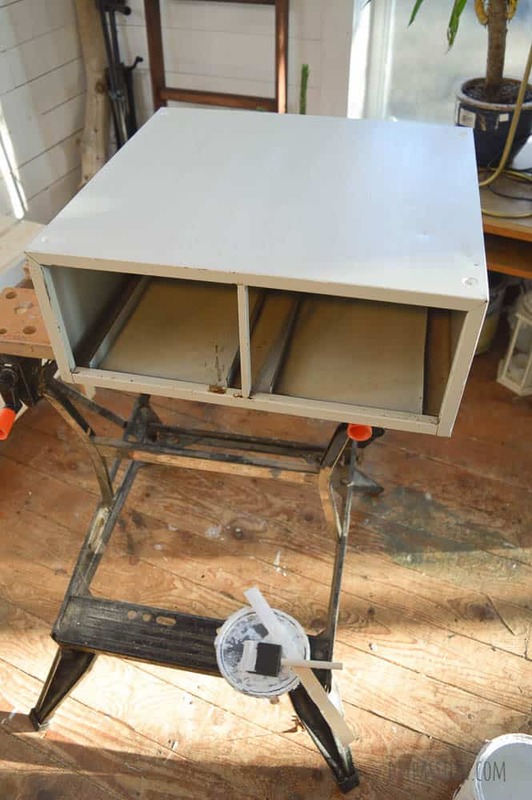 After I got the whole cabinet to this point – I let it sit and cure for 24 hours while I worked on finishing up the little table base. I just kept layering and dry brushing until I got it to where I thought it made sense. In the end, I decided to add some mending brackets to the front of the table to tie it all together with the card catalogue. I sprayed them gold and them went over them with the Furniture Glaze to give them a bit of a patina. I’m so happy with how this turned out. I was nervous throughout this whole project. But I think this will be the perfect addition to my photography studio set up. 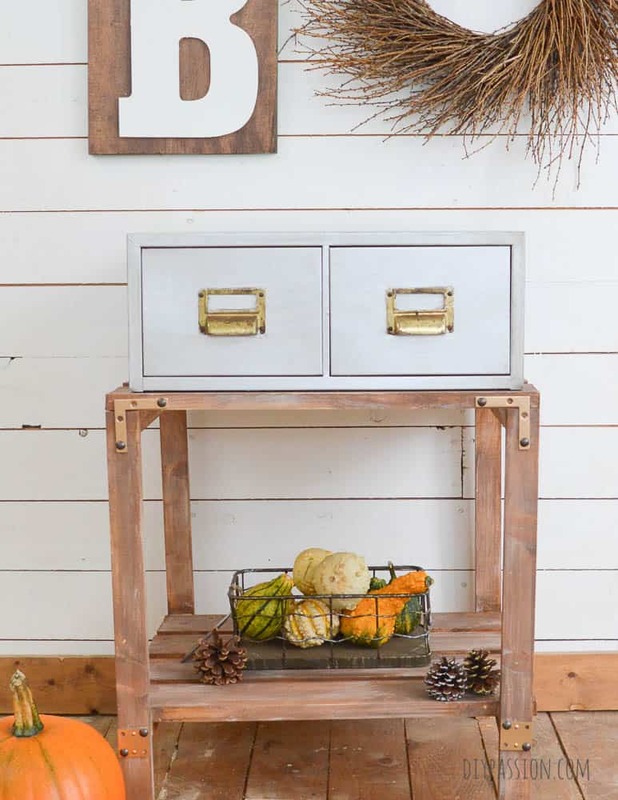 You’d never even know this piece was once a gross drab beige… It looks like it was always an industrial galvanized piece. 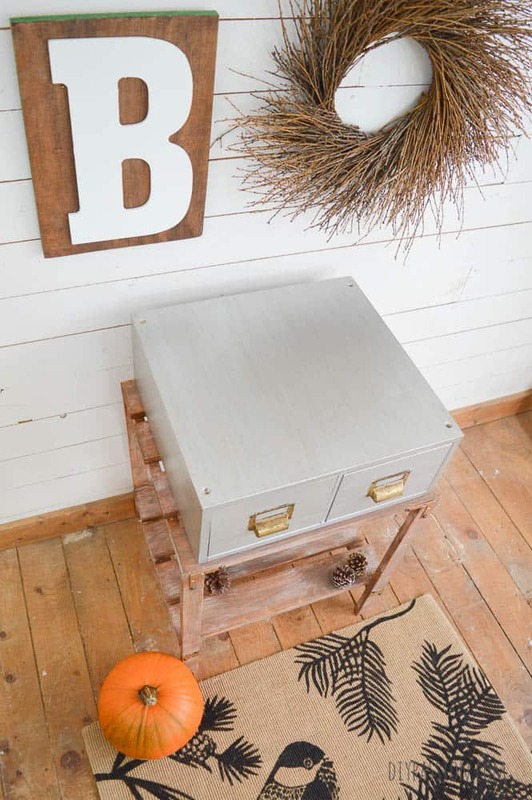 Lisa from Recreated Designs has her own take on how to paint something to look like metal. 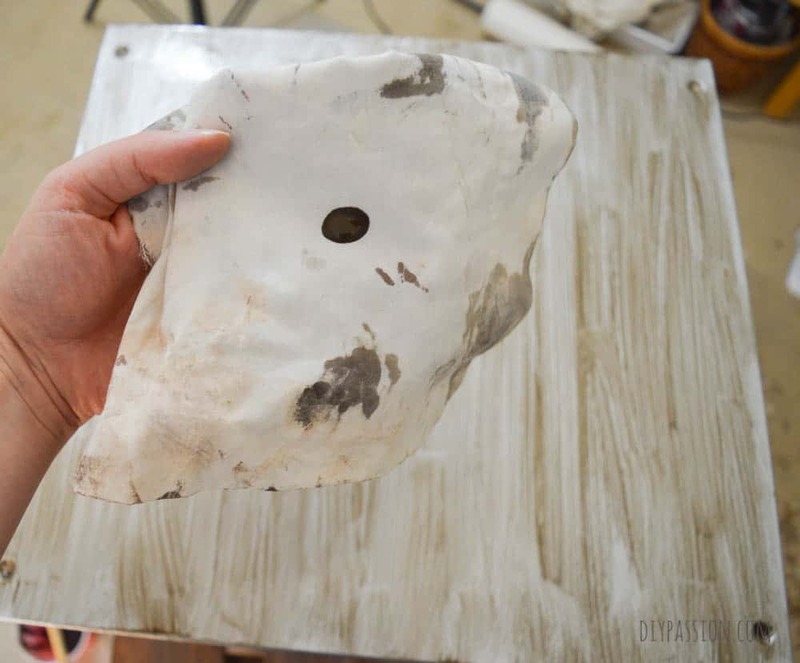 Unskinny Boppy has a great tutorial for how to use metal flashing as decor using spray paint to make it look aged and galvanized. So cute! 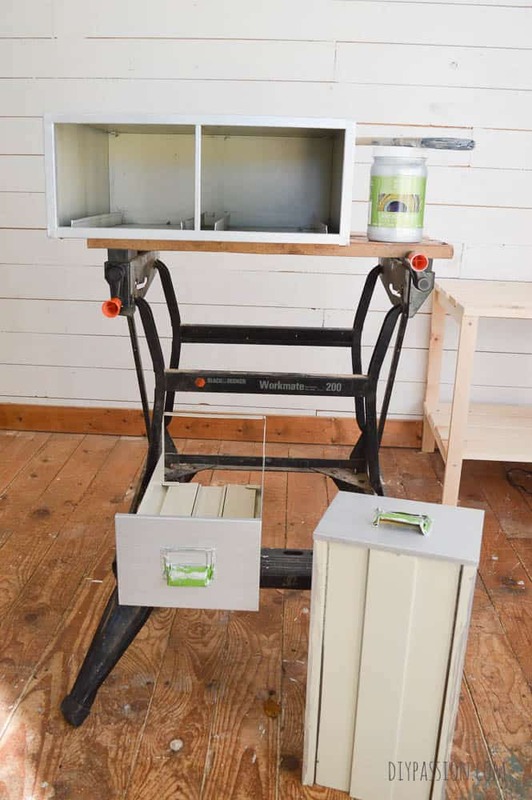 An Oregon Cottage has pretty much the cutest tutorial I’ve ever seen for painted galvanized Christmas houses. Like I can’t handle this….It’s way too cute! This post contains affiliate links and we were provided product for review by Modern Masters. You can see our full privacy and disclosure policy here. How to Make your own Doggy Holiday Treat Pouch! These two pieces pair up nicely …you did such a great job on both pieces. That’s pretty amazing! Great project and tutorial. Thanks for sharing! It’s absolutely perfect! What a brilliant idea! Awesome handy work with that base! It turned out so good! This turned out great! 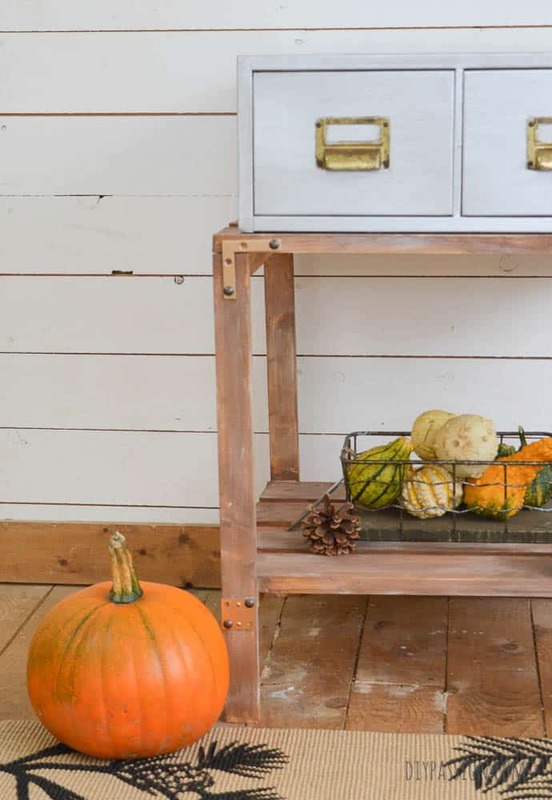 That little table is adorable! It looks great! I love the little stand you made. 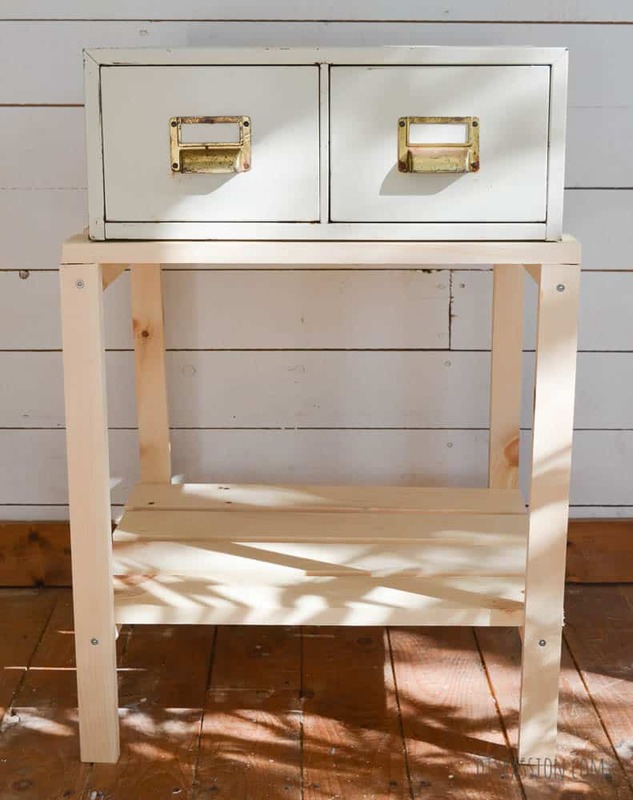 I have two of these card catalogs and was planning to use a chair (minus the back) as the base. Wow! This is such an amazing piece! It turned out so beautifully. For someone who was nervous to build and had never painted metal or used glaze before, you did a perfect job!! This turned out SO cute!! I love how the hardware you added to the table you built ties the top card catalogue right in. It is adorable! I love this idea so much. It turned out amazing! This is an over the top good re-do. 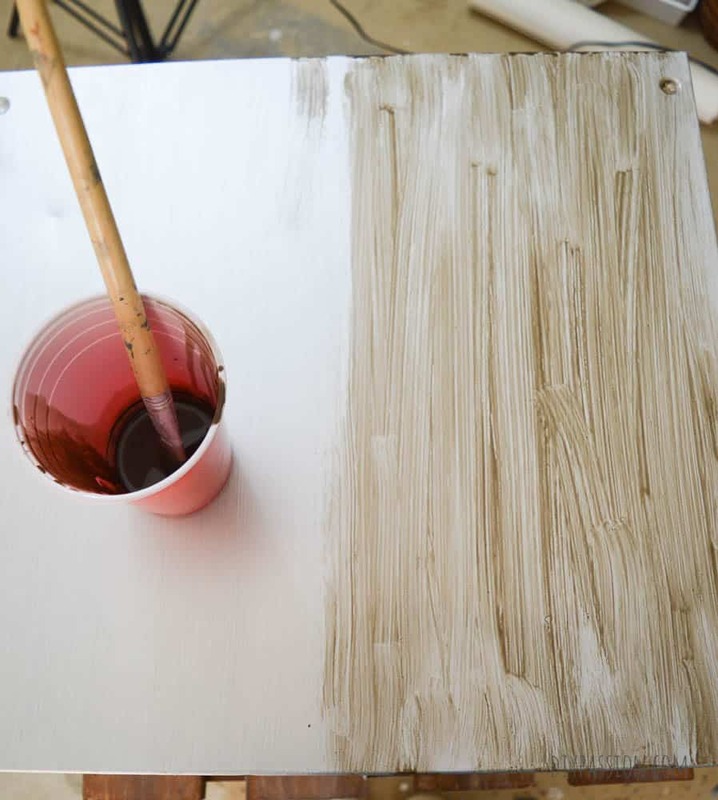 I am definitely going to have to try this paint – I love MM. 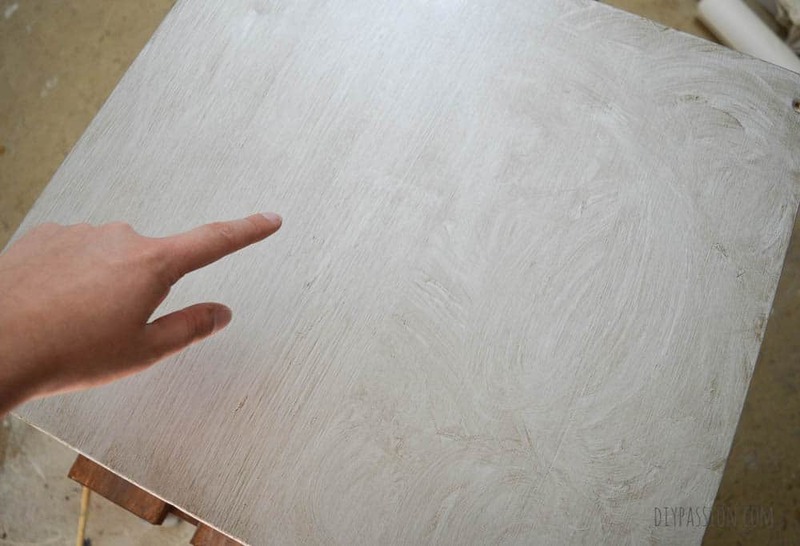 The table is perfection, I love the way you just whipped that up! Such a precious project!